Wasatch Backcountry Alliance has been working hard on several critical concerns to the backcountry community. 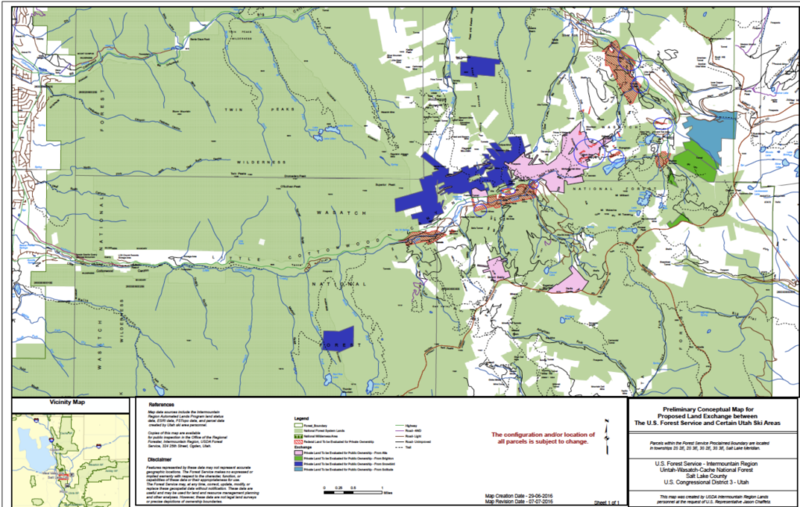 While we have supported the Mountain Accord process, in July we discovered potential threats when new conceptual maps were submitted as a part of the bill to create The Central Wasatch National Conservation and Recreation Area (CWNCRA). Problems alarming enough that at times we’ve strongly considered withdrawing our support for the legislation – and publicly fighting it. This may still happen. As of September 13, 2016, we continue to work with a variety of parties to resolve these concerns. We remain hopeful that we can support the legislation. Our concerns represent some of the most critical areas for the backcountry community, which are also some of the most contested areas in the Wasatch. These issues have been overlooked, or not seen as a serious threat by others involved in the process. As an organization dedicated to representing the dispersed winter backcountry user, we feel differently. We looked very closely, and when we did, these maps not only were inconsistent with the signed Mountain Accord, but also pose serious threats to the Wasatch backcountry. We have made significant progress, correcting issues surrounding Silver Fork, and the proposed Solitude Honeycomb lift realignment. We continue to work with Alta Ski Lifts, the US Forest Service, and Mountain Accord to resolve our concerns surrounding Grizzly Gulch. Issue #1: Silver Fork at Risk with Solitude Resort Boundary Adjustment Area for a lift realignment for the Honeycomb lift. Concern: The map submitted as part of the CWNCRA was inconsistent with the language specifically spelled out in the signed Mountain Accord. The maps, which did not go under broad review prior to the legislation being submitted, increased the acreage of the boundary adjustment from the agreed to 15 acres, to nearly 50 acres. Additionally, the placement of the new lift potentially opens up Silver Fork to side-country resort usage, where Solitude lift ticket holders could potentially hike up, ski down Silver Fork, and have a lift conveniently located at the bottom, potentially enabling a very large ski resort creep to one of our most beloved undeveloped backcountry areas. Wasatch Backcountry Alliance immediately contacted Solitude (and its parent company Deer Valley) to discuss our concerns. Solitude was extremely responsive, has altered the maps, and verbally committed to Wasatch Backcountry Alliance they will work with the backcountry community to ensure Silver Fork will be preserved. We believe the map issue was unintentional, but feel it was of enough concern to take action. Issue #2: New Land introduced at the Head of Grizzly Gulch Opens Potential for Lift. Through some of the studies we’ve funded, we’ve identified Grizzly Gulch as the most used winter backcountry area in the Central Wasatch. There have been a variety of reasons Alta Ski Lifts has not been able to build a lift up Grizzly and expand. One of these has been some critical public lands that have served to block this potential expansion. Concern: When the conceptual maps were introduced as part of the CWNCRA, we noticed that a piece of land above the summer road that had never been discussed or reviewed had been added to the map as part of a land exchange. Our concern is the proposed land exchanges abutting to and in the Grizzly Gulch parcel are upside down from the Accord’s stated intent. One can easily look at these specific parcels and come away convinced the exchanges are drawn with the express intent of facilitating lift connections and ski area expansion — the very things the Accord is intended to keep in check. Wasatch Backcountry Alliance has been in discussions with Alta Ski Lifts, the US Forest Service, and Mountain Accord about our concerns, and remain in negotiations to correct the maps to align with the intent of the signed Mountain Accord. We are being told that the US Forest Service is interested in removing base area lands that are not aligned with its mission. Alta Ski Lifts has said once the US Forest Service agrees to remove this piece of land, that they will agree to the map change. We will keep you posted. What you can do: Stay informed, and Donate. At this point, we ask that Wasatch Backcountry Alliance members continue to follow this process, educate yourself about the issues, and be prepared to act with us, when we decide to either withdraw our support and fight the Mountain Accord, and the pending legislation CWNCRA – or when we resolve all concerns, and can fully support it. For more on this very complex issue, please read our more comprehensive blog here: Member Update: Mountain Accord, the Central Wasatch Conservation and Recreation Act. Thank you for your continued support, and your concerns about protecting the Wasatch backcountry. There were some items that were excluded from the maps . I don’t know whether you noticed this or not but they’re designed to give the ski resorts ultimate power and increase their value for selling; which they didn’t have before. How do I contact you to go over the Maps?